With just over nine minutes left in the fourth quarter against TCU, Texas got the ball back on its own 24 with a one possession lead. Texas was presented the opportunity to run the clock, run over the opponent, and ice the game in two of the last three weeks. Although Texas and Tom Herman prefer to “just sit on them,” that’s not exactly how Texas excelled in this final drive. There were a couple of plays that Texas’ size advantage was used to gain yardage, but it was the cumulative result of almost 40 rushing attempts against the Horned Frog defense that led to the results more so than the effectiveness of the six on the final scoring drive. That cumulative result was exhibited by poor tackling from a Horned Frog defense known for having discipline starting at the top. 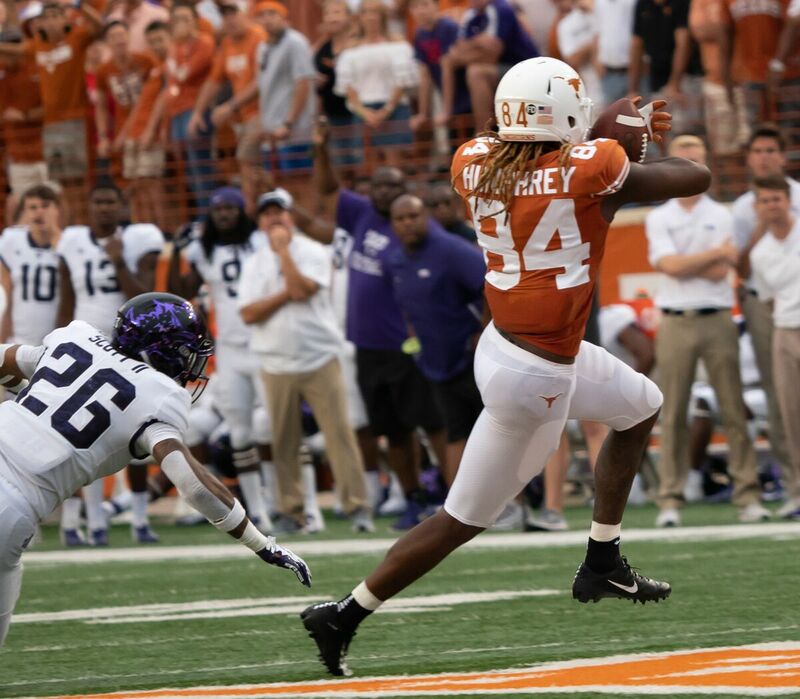 Texas attacked the perimeter effectively, got what it needed in the interior run game, and used one lapse in coverage thanks to the absence of a pass rush and a great throw by Ehlinger to end the TCU winning streak against the Longhorns. The make-or-break drive had an inauspicious start. Corey Bethley quickly shed Patrick Vahe to tackle Tre Watson in the backfield, putting Texas behind the sticks when it could least afford it. As a result, Texas put the ball in the hands of its best playmaker at receiver to create a third-and-manageable. Duvernay and Johnson occupy their defenders just long enough for Humphrey to roll to a five yard gain. This play is a result of a tired defense unable to make a play on an in-rhythm receiver. Humphrey’s in route keeps the pursuit from getting to Johnson’s in route before they can stop him behind the line-to-gain. Johnson’s corner also shows fatigue in being unable to drag Johnson down before the first down marker. Either Vahe or Andrew Beck misses his assignment, and Garret Wallow is in the hole to meet Watson. Wallow had been all over the field, but Texas’ cumulative rushing attempts shows its effects here. Wallow can’t wrap up a similarly sized Watson in the hole, and Watson turns upfield from the tackle to get six. Ehlinger throws a solid ball to the field side asking Humphrey to block for a Duvernay screen. Humphrey doesn’t provide the best of blocks, but Duvernay escapes a tackle from the TCU corner LJH occupied, gets upfield to the line-to-gain, and stays inbounds. This keeps the drive going on the TCU defense and keeps the clock rolling. At this point, the TCU defense has been on the field for three minutes and had only given up 16 yards. Kerstetter pulls and gets cut, but pancakes his man. The corner on the outside follows Duvernay on his route, giving Watson plenty of running room to get upfield. Smart like a senior, he remains in bounds and the clock keeps rolling. Daniel Young sees some action on this drive, getting another first down on a short run. At this point, Texas’ OL has hands on its hips, but they’ve continued to roll. They aren’t necessarily “sitting on the Frogs” this drive, but the cumulative rushing attack is starting to take its toll on the smaller defense. Perimeter passing forces inside players to go outside, and Texas responds by going right back inside on those defenders who had to sprint to the sideline. The TCU defense has been on the field for almost four minutes. Watson gets stood up in the hole, a nice stop for TCU. Watson again grabs just a couple of yards. This becomes a crunch time third down play, put up or shut up for the Texas offense. 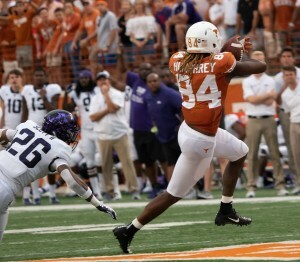 Texas goes empty, and TCU employs the defense that Texas has struggled to pick apart in passing downs. TCU drops eight, and Sam Ehlinger starts to feel some pressure in the pocket. He moves up, seemingly on his way to a scramble. This pulls two of the three TCU defenders who were in Humphrey’s area, and Humphrey accordingly breaks toward the sideline. Ehlinger throws past the one defender now on Humphrey’s hip, he evades the tackle, uses a block from Johnson, and evades one more tackler to get into the end zone. In the end, it wasn’t a classic Tom Herman run-the-football-until-they-tap drive that he prefers. It used a combination of inside running, perimeter passing, and clock management to wear out the TCU defense. When a defense is tired, it makes lapses in judgement. That fatigue came from “just sitting on them” over the course of the game, revealed itself in earnest on the final drive, and ultimately resulted in Texas’ final scoring play to end it’s losing streak.